Do you have projects using Google technologies or do you want to develop something awesome? Do you want the chance to showcase them? GDG Philippines is organizing the first GDG HackFair Philippines on December 19-20, 2015. Submit your mobile, web, or IOT projects on or before December 12. This is open to everyone: professionals and students (grade school to college students). We will be selecting projects in Health, Education, Productivity, Music, Arts and Culture, and Social Impact. Selected projects will be invited for the exhibit and mini-conference. To help you in your projects, we will also do GDG HackTime events. In Manila, our HackTime will be on December 5. There will be talks about different Google technologies and time for hands-on development. Registration for GDG HackTime and submission for GDG HackFair will be opened in the next few days. Add us on Google+ for updates. Please check details about HackTime and HackFair at http://hackfair.gdgph.org. Update: Application for GDG HackFair Philippines is now open! 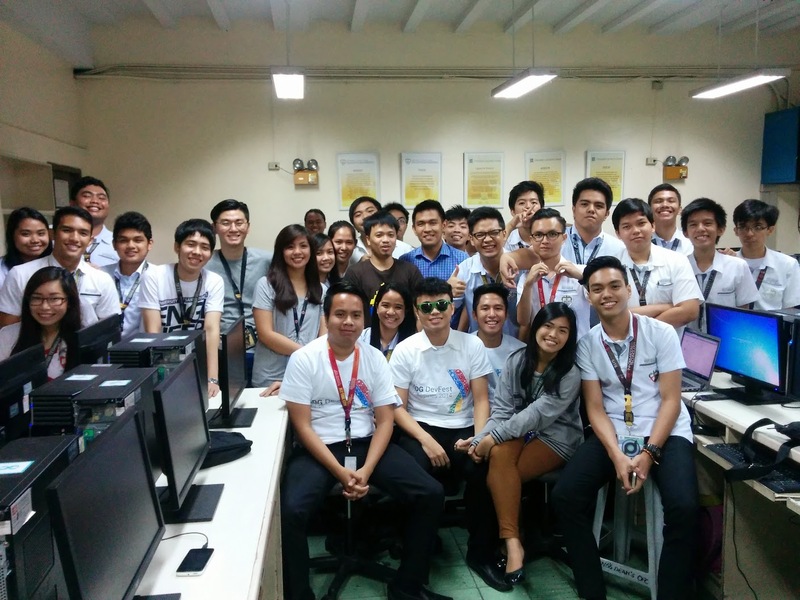 We held the finals of Android Masters on October 23, 2015 at PLDT Innnolab. Congratulations to the winners of this year's Android Masters! Our winner for the Games Category is Space Voyage from Team B, De La Salle University Dasmariñas (Games Category). The Productivity/Utility Category winner was Crime Chase from JaguarTech, University of the Cordilleras. Thanks to our judges, sponsors, volunteers, and participants who joined Android Masters 2015! Join us on the afternoon of September 12 for a Beginner Android Game Development Workshop. This will be at Jose Rizal University. Please sign up at https://goo.gl/kLR4rf if you are interested to join and learn. Check the Google+ events page at https://plus.google.com/events/cq5an65addacc8kd0eccltejkr8 and our Google+ page for updates. Google I/O is Google's annual developer conference, where they share the latest products and technologies. For the past years, GDGs worlwide organize I/O Extended live viewing parties. This year, we're bringing the I/O experience to different cities and help the professional and student developers deep dive in the new technologies. The Google I/O Extended Roadshow is a series of workshops and talks centered around the technologies announced during Google I/O 2015. We're still finalizing the agenda, registration, and other details. Add GDG Philippines in your Google+ circles for updates about our events. GDG Baguio is also organizing I/O Extended events in Baguio (June 20), Nueva Ecija (June 24), and La Union (July 11). Add their Google+ page in your Google+ circles for updates. GDG Bacolod will have their I/O Extended on July 4. Add them in your Google+ circles for updates. Please check http://ioextended.gdgph.org for details and add GDG Philippines in your Google+ circles for updates. Excited for Google I/O 2015? Google I/O is Google's annual developer conference, where they share the latest products and technologies. If you are not attending in person or one of the I/O Extended events worldwide, you can watch I/O Live at the I/O Website (http://events.google.com/io2015). 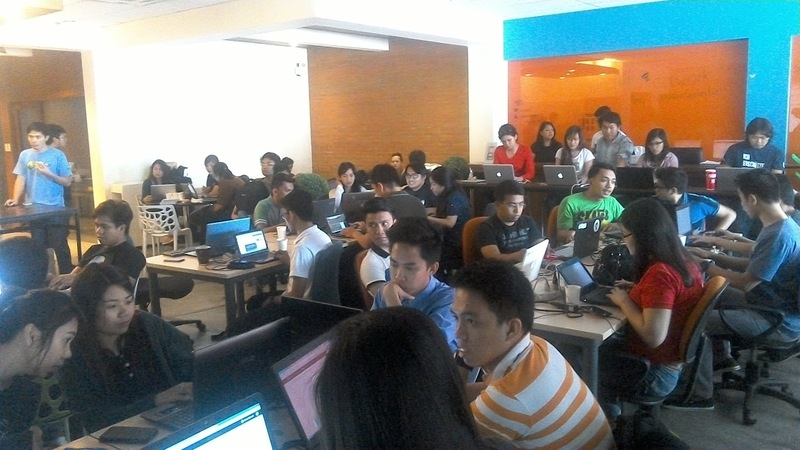 GDG Philippines, in cooperation with Devcon Philippines, Manila AngularJS Developer conducted an AngularJS Code Camp at co.lab xchange last April 25. Wayne Manuel, GDG Philippines community manager, and Benj Tupas, GDG Bacolod Community Manager, facilitated the whole-day event. Can't go to San Francisco to attend Google I/O 2015? Get the I/O experience by attending Google I/O Extended events being organized by Google Developers Group worldwide. The Manila I/O Extended event will be held in Globe Corporate Showroom, Valero Telepark, No. 111 Valero Street, Makati City. (Map: http://bit.ly/Map-ValeroTelepark) on May 28-29 (08:00 PM of May 28 to 05:00 AM of May 29). Polymer is a new kind of library, built atop Web Components, that enables developers to create their own encapsulated, custom HTML elements. With Polymer and Web Components, we can componentize the web! Polymer Polytechnic is an event series of in-person, community-run events to help developers learn Polymer. These events are run by local Google Developer Groups or other developer meetups all over the world. For the GDG Philippines Android Study Jams, there will be a total of seven Saturday sessions. The first six sessions will be for the six lessons of the course (one lesson per week). Each session, we will have a short discussion of the lesson for the week (questions, challenges, etc) and participants can work on their individual projects. (For each week's sessions, participants should have already finished the lessons for the week.) The seventh session will be for the presentation of final projects. If you are interested in joining the Study Jams sessions, please fill up the form here. You would also need to join the Google Developers StudyJam Group on Udacity. Please start/continue with the Android Fundamentals Course and attend the Study Jams! GDG Philippines is organizing a seven-week Android Fundamentals Study Jams on February-March 2015. This is part of the Google Developers Study Jams, free series of global, community-run, in-person study groups. The first jam session is presented in partnership with Udacity and will follow their Android Fundamentals curriculum. This series will be led by certified Google Developer Group facilitators. Official sign up for the Study Jam will be through http://www.googledevelopersstudyjams.com/, which will open on January 2015. In the Android Fundamentals Study Jam, there will be a total of seven sessions (6 sessions for the 6 lessons and one for final projects sharing). For each week's sessions, participants should have already finished the lessons for the week. Each session, we will have a short discussion of the materials for the week followed by discussions around the lessons (questions, challenges, etc). After that, participants will be working on their individual projects. Details about GDG Philippines Android Fundamentals Study Jams will be announced soon. If you are interested in joining the Study Jam sessions, please fill up the form here.